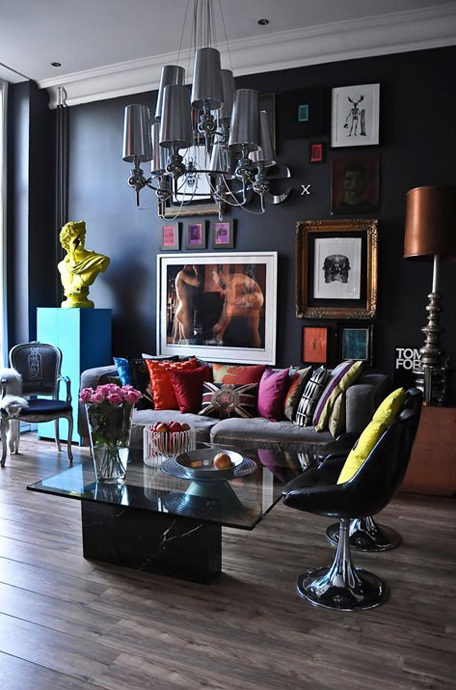 If you’re looking for modern decorating ideas that will easily transform your rooms without having to toss out your furniture and accent pieces, or even bring down a wall or two, you might want to consider an easy yet dramatic fix—apply dark colors to your walls. Afraid it will make your room look smaller? Designers totally dispel this myth – dark colors don’t make rooms look cramped or smaller; they actually make it cozier. One decorating pro notes, "Some people think that dark walls make a room look small, so they should only be used in big, well-lighted rooms," says Jay Jeffers. "But I'd use a dark color in any room, because I think dark colors make a room look cozy." 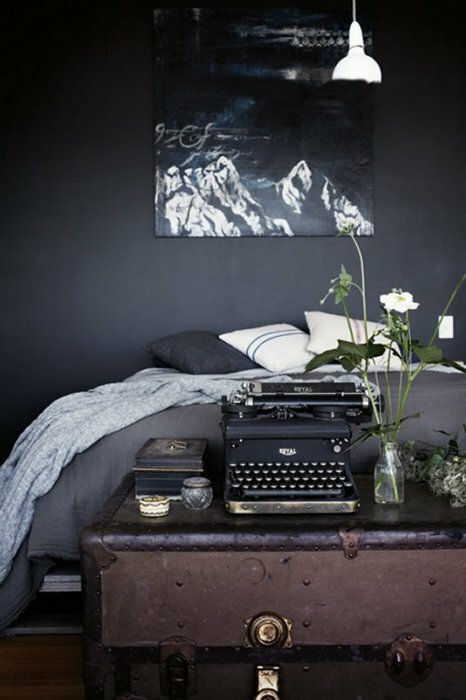 Indeed, using dark or earthy hues will make your rooms classy, elegant, inviting and cozy. Painting your modern rooms in dark and daring colors such as deep red, black, magenta, or navy blue will give more character and depth to your space. Aside from dazzling your guests with striking color foundations, your furniture, lighting and accent pieces will definitely stand out. 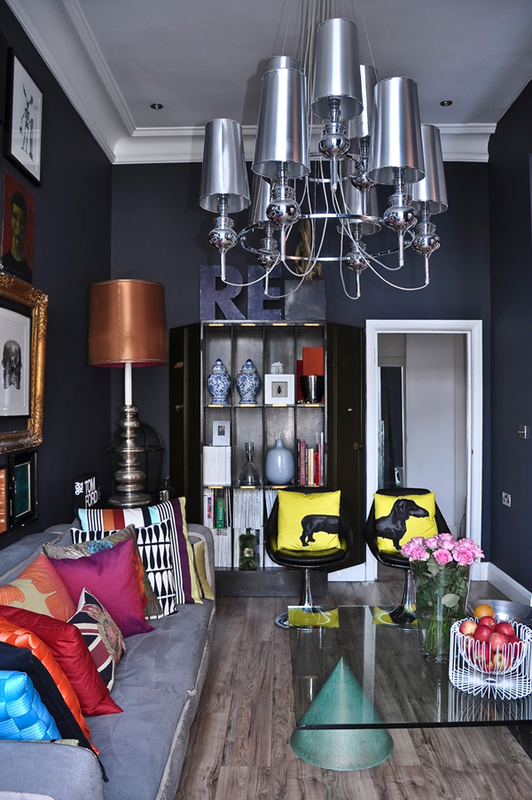 Let’s take a look at some modern spaces that dared to go dark and bold. This is one noteworthy modern decorating idea that will surely transform your space from dull to extremely interesting and eye-catching. The dark walls go very well with the abstract painting in dark colors, plush sofa, bronze-gilded mirror as well as the afghan thrown on the side chair. Needless to say, the tall window with white draperies brings natural light to the room while giving off a romantic/nostalgic vibe. Who says black and brown will give your room a drab look? Clearly not, the dark colors used in this room make it look elegant and warm. The brown velvety sofa never looks more inviting because of the dark hues surrounding it. Proof that dark colors will not make your rooms appear small; this modern living space radiates homey-appeal, thanks to the solid dark walls, white ceiling and functional furniture. The limited space is no hindrance here – the lone sofa, clear glass-top table, multi-shelves, side lamp and framed wall art compliment the dark color of the room. Go crazy over bright, vibrant colors! This shabby-chic room is one great example of how colors can bring life to any space. Don’t shy away from throwing in more than a couple of colorful pillows on your lounge chair. And if you’re into gallery wall art, the dark foundation will make them pop out, too. 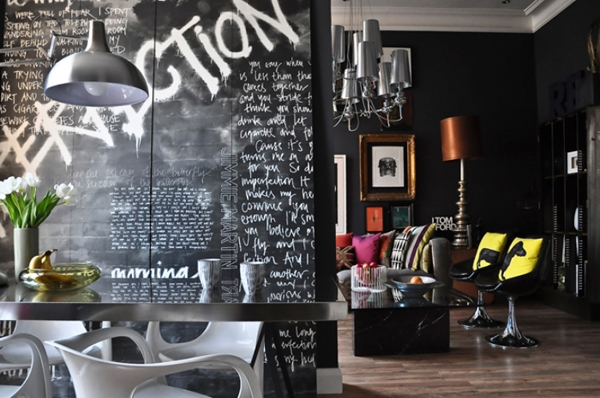 The clever use of chalkboard paint in this modern space is truly amazing. 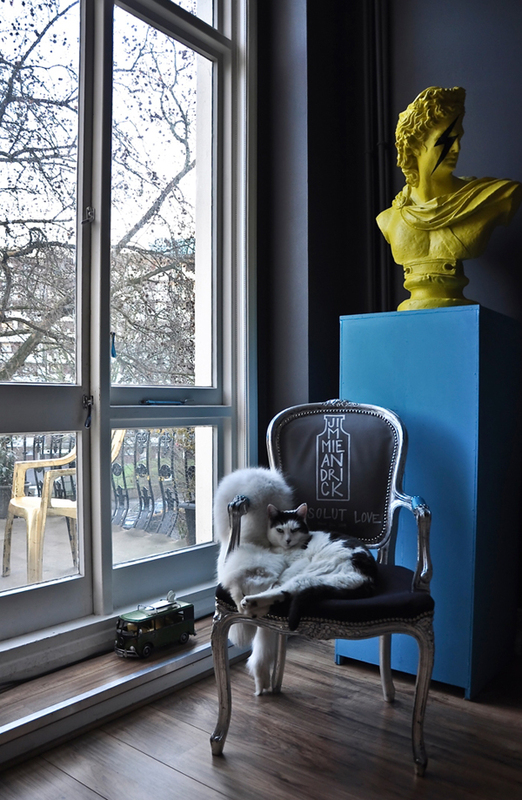 This art-deco apartment gives off a lively, modern and playful vibe. If you’re thinking of doing a makeover of your space, you might want to use one color all throughout your space, breaking the flow only with stunning furniture in stainless steel, glass, bronze and wood. Minimalist is never boring – much so if you use bold colors. This nook is simple yet provocative – thanks to the dark blue, white-framed windows, natural wood floor and lone brass chair. Your vintage pieces will complement your dark walls. Really. This bedroom exudes nostalgia and undeniable charm. If you want to sleep in a room that will relax your mind and body, this is surely it. If you think that only brilliant colors can get your creative juices flowing, think again. Paint your modern home library in dark, earthy hues to make your surrounding look and feel calm and soothing. For more modern decorating ideas, visit the 212Blog often.